Have an adrenaline-pumping time with the gang! Your barkada is a solid group and you make it a point to see each other every so often. But pigging out at food districts, having conversations over coffee, and partying late into the night may start to feel a bit blah. If that’s the case, why not try something new like visiting an adventure park? Adventure parks have thrilling activities and attractions that will definitely make for an extraordinary experience. You'll not only have a fun time, but also get to burn some carbs while you're at it! In addition, there are also some adventure parks that offer team activities that will strengthen your friendship. With that, here are five adventure parks that are easily accessible from Metro Manila for that thrilling barkada weekend trip. Treetop Adventure is perfect for nature lovers and thrill-seekers. With rides set amidst a lush wildlife background, visitors are sure to enjoy a satisfying mix of relaxing nature sceneries and blood-pumping adventure. You and your friends will get to zip-line through trees like Superman with their aptly named Superman Ride, or have a heart-stopping freefall from their Tree Drop attraction. If you're afraid of heights, you can just opt to take the trekking adventure. Take the North Luzon Expressway (NLEX) and exit at Dau in Pampanga. Enter Subic-Clark-Tarlac Expressway (SCTEX) and get off at Tipo Road. At the intersection, make a right and then turn left towards Argonaut Highway. Drive continuously towards Aparri Road and just follow the signs towards Treetop Adventure. 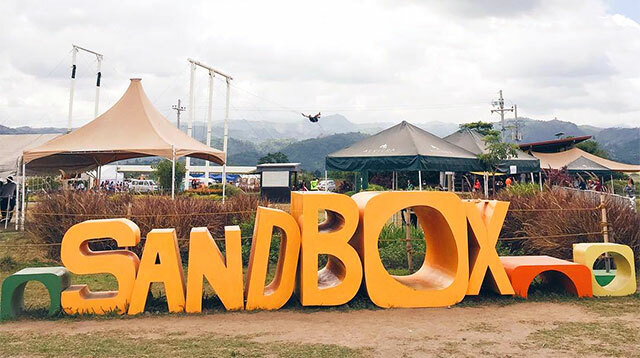 Sandbox is another great adventure park in the north. Located within the urban residential district of Alviera, Sandbox is like a huge playground for both kids and adults with its variety of outdoor attractions and activities. Some of the popular ones are the Giant Swing and the Adventure Tower, a five-story high structure with facilities for rappelling, wall climbing, free falling, and others. If you're a fan of zip-lining, then you'll love their Avatar One ride, which is said to be the country's first roller coaster zip-line. You can also try outdoor archery and ATV or UTV rides. Take the NLEX and get off at the SCTEX exit. After driving through SCTEX, exit at Porac. There are already many outdoor attractions in Nuvali, but the recent opening of Camp N just adds more reasons to visit this leisure destination in Sta. Rosa, Laguna. Camp N lets individuals, teams, and even companies embrace their adventurous sides while appreciating nature. Your barkada is sure to have a blast at the Adventure Tower, where you can go wall climbing, rappelling, and try out the roller coaster zip-line. There is also an Aerial Walk and some obstacle courses if you're up for a challenge. Drive along South Luzon Expressway (SLEX). You can take these following exits to reach Nuvali: Greenfield City/Unilab/Mamplasan, Sta. Rosa, Eton City- Greenfield, Silangan, or Calamba. For inquiries on fees and bookings, check their website. Camp Explore is one of the most accessible adventure parks from Manila. Located at Mount Purro Nature Camp in Barangay, Calawis, Antipolo City, it is primarily a campsite that encourages campers to disconnect from the world and reconnect with nature, but it also has many adventure facilities. Rope courses and obstacle courses are available for team building activities. There is also a zip-line for that rush you've been craving for. For commuters, take a jeepney bound for Cogeo in Antipolo at Aurora Boulevard or Marcos Highway. From there, take another jeepney going to Paenaan and get off at Kanto Veterans. Once there, you’ll need to take two tricycle rides towards Mount Purro Nature Camp. Though Pugo Adventure Park is a located in La Union, the five-hour road trip will definitely be worth it. Pugo Adventure Park, or PUGAD, is a resort and adventure park rolled into one. Expect to have a thrilling and relaxing time with your best mates when you visit. There are five different kinds of zip-lines offered at the park as well as a zip-bike ride. You can also go wall climbing, rappelling, or try the reverse rappelling (also known as the Australian Rundown). Your friends can also battle each other at the paintball field. In addition, there are watersports available, including kayaking, water skiing, and paddle boating to name a few. If you're tired from all the activities, you can take a refreshing swim in the pool. There are also accommodations onsite if you plan to stay the night. From Manila, drive through the town of Rosario towards Marcos Highway. Drive along the highway until you reach the town of Pugo. Follow the signs towards PUGAD. The adventure park is less than a kilometer from the main road.